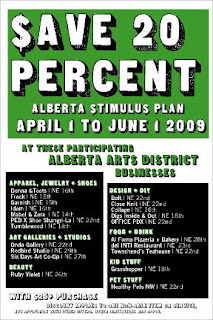 Alberta Street brings you our very own stimulus plan! Here is how it works: shop at any of the participating businesses and when you spend over $25 they will give you a coupon to get 20% off your NEXT purchase at any of the participating businesses. Offer runs now until June 1st. The only exception at Garnish is that wedding dresses and alterations are not included. Spread the word, and the love!